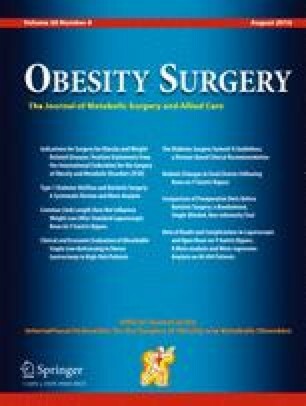 Different bariatric surgeries have demonstrated different effectiveness for weight loss and glucose control in obese persons with diabetes, over a short follow-up time. The aim of this study was to compare weight loss, glucose control, and diabetes remission in individuals with type 2 diabetes, after three types of bariatric surgery: gastric banding (GB), sleeve gastrectomy (SG), and Roux-en-Y gastric bypass (RYGB), with 5 years follow-up. A retrospective study was conducted on bariatric surgeries performed during 2002–2011 in a large nationwide healthcare organization. Of 2190 patients, 64.8 % were women. The operations performed were 1027 GB, 1023 SG, and 140 RYGB. Mean BMI ± SD at baseline, 1 year postoperatively, and 5 years postoperatively were 43.5 ± 6.18, 37.1 ± 6.35, and 35.5 ± 6.48 for GB; 43.6 ± 6.42, 34.4 ± 6.08, and 35.3 ± 6.7 for SG; and 42.8 ± 5.81, 32.8 ± 4.9, and 34.1 ± 5.09 for RYGB. Mean HbA1c ± SD at baseline, 1 year postoperatively, and 5 years postoperatively were 7.6 + 1.58, 6.5 + 1.22, and 6.8 + 1.48 for GB; 7.7 + 1.63, 6.4 + 1.18, and 6.7 + 1.57 for SG; and 8.0 + 1.78, 6.3 + 0.98, and 7.04 + 1.42 for RYGB. At 1 year follow-up, 53.2 % had achieved remission; at 5 years, 54.4 %. Remission rates at 5 years were similar for the three surgeries. Five-year remission was inversely associated with baseline HbA1c and with treatment with insulin at baseline and positively associated with BMI. For all three surgeries, diabetes remission was higher than the baseline after 5 years; mean BMI and HbA1c decreased considerably during the first year postoperatively and remained lower than basal values throughout follow-up. Early improvements were greatest for RYGB, though the advantage over the other operations diminished with time. The work was performed in Clalit Health Services in Israel. Since all data were obtained from medical records and no identifying information was included in any of the study documentations, informed consent from patients was not required.